The Overlord of the Gonjaland, Yagbonwura Tutumba Boressah has formed a mediation committee to work out optimal resolutions to the numerous chieftaincy disputes in various parts of the traditional area that have threatened to undermine the authority of the Gonja King and divide his people. For almost a decade now, the Gonjaland Traditional Area has been a national hot-spot for chieftaincy unrest mostly between royal families. Chieftaincy violence and tensions have persisted in at least six (6) paramountcies in the Gonja Kingdom, leaving a devastating toll of retrogressive impacts on the Gonjaland and its inhabitants. Interventions by the Yagbonwura to settle disputes in troubled paramountcies have created parallel authorities across many traditional villages and towns and a rift between the Ndewura Jakpa Palace and local kingmakers. His interventions have invoked multiple lawsuits against him with most of his rulings getting overturned either in courtrooms or at the Regional House of Chiefs. Competing claims by chieftaincy gates in Bole, Damongo, Kafaba, Kulor, Kebelma, Mandari, Sonyor, Daboya, and Makango, Kilibu, Korsorgu paramouncies and traditional skins have led to heightened insecurity, scared investors and limited residents in conflict areas from benefiting socioeconomic interventions from governments and benevolent bodies. Many people including innocent women and children have also lost their lives in sporadic clashes. However, with the creation of the Savannah Region, the Yagbonwura wants to end all disputes and curtail its destructive impacts and ensure reconciliation in the Gonjaland territory, as he prepares to drive a new region heavily underdeveloped by all indicators. The Yagbonwura is also preparing to receive an honorary Doctorate Degree to be conferred by Poltava University of Economics and Trade (PUET), a Ukrainian University. 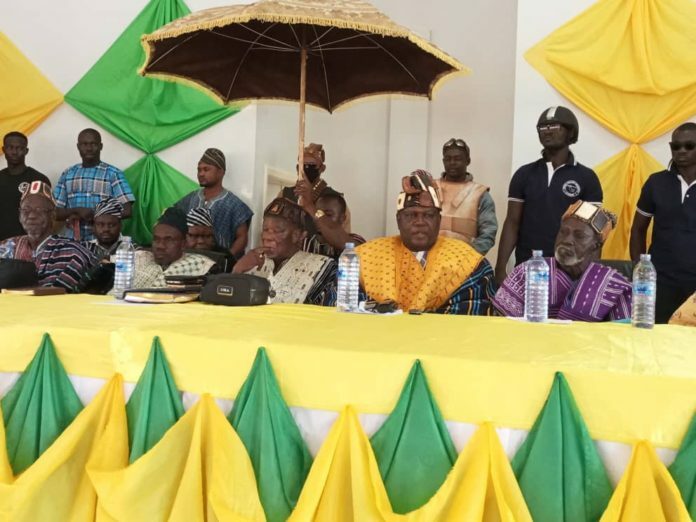 The Council, Academic Board and other Boards of the institution said they are honouring the overlord for his dedication to progress and development of the Gonja kingdom and the entire country. A five member committee has therefore been setup to assist the rival parties to negotiate settlements in all the contested areas. The Committee was outdoored on Saturday, April 13, at Salaga, the East Gonja municipal capital. The Committee would be chaired by the chief of Buipe and Vice President of the Gonjaland Traditional Council, Buipewura Abdulai Jinapor II. The other members are: Kpembewura Gbangbangne Ndefeso IV, paramount chief of Kpembi, Kusawgu wura Kunkraga I, Tulwe wura Bunyanso l and Kong wura Jinkurge l.
The Saturday meeting brought together all members of the disputed royal gates for a consultative engagement on how to resolve the disputes. The mediation committee is expected to complete and present its findings within 60 days. Chairman of the committee, Buipewura Jinapor II, speaking to journalists said, Gonjaland intends to use the Dagbon model to resolve all outstanding chieftaincy misunderstandings. He called for government’s support to enforce the outcomes and resolutions of the committee. “We have outstanding chieftaincy disputes. We want to see how we can clear all the chieftaincy issues to lay a good foundation for the Savannah Region,” the chief explained adding, “We are taking cues from the Dagbon. We must take a cue and try as much as possible to settle all chieftaincy issues, which is about eight – and by the grace of God we shall settle them in 60 days,” he said. “But we need government support. Government uses a lot of money for security purposes, if these chieftaincy issues are settled, they would not use money for our development in this fruitless and frivolous things”. The Kpembewura in his welcome address recalled how he hosted similar meeting a year ago that planned and raised awareness towards the savannah region and expressed privileged and honored to host another stakeholder consultative meeting this time around towards resolution of chieftaincy issues which has become the single biggest bottleneck to a peaceful take off of the newly created region. He said chieftaincy disputes have dented the chieftaincy structure of the Gonja people, which he said, used to be model of reference and admiration and represented an epitome of royalty, peace, unity, friendliness, and love. “Gyira, chairman, can all these things be attributed to Gonja today?”, the chief asked rhetorically. “I know none of us gathered here is happy and proud of this disturbances. The fortunate thing is that, this disturbances are internally within the larger Gonja family”. He envisaged that, once the issues are within family, among brothers and sisters and not any outsiders, it becomes easier to resolve through patience and painful sacrifices. “This is what will help,” he said, “to restore our fast eroding pride and dignity and also ensure we continue to live in peace and harmony”. The Savannah Regional Minister, Salifu Adam Braimah thanked the Gonjaland Traditional Council and all stakeholders for the initiative, saying without peace, the new region will remain far from achieving “the good things it deserves”. He said the biggest threats to the progress of the new region are chieftaincy and illegal logging of Rosewood and called for concerted and coordinated efforts to confront developmental challenges in the region.